Puppetry is generally popular around the world. Russia, Vietnam, Persian, Japanese, and other countries have their own traditional puppet shows, and Indonesia is not an exception. Indonesia’s traditional puppet shadow show is called ‘wayang’ and is very popular around the world due to its uniqueness and the philosophy that it delivers. This indigenous performance influenced by Javanese and Hindu culture is growing rapidly on the island of Java and Bali, Indonesia. The show is also popular in some areas such as Sumatra and Malaya Peninsula. 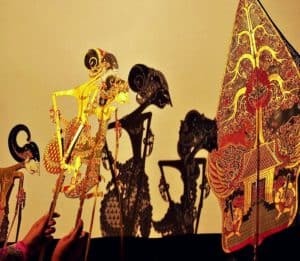 The puppet shadow show (wayang) in Indonesia also has its own style of speech and uniqueness, which is the original masterpiece of Indonesia. 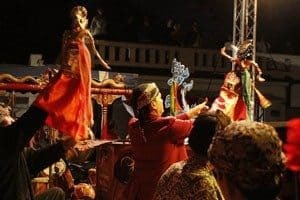 Thus, Indonesian Traditional puppets is the art performance which not only performed in its origin land, Java, but it is also now presented around the world. Therefore, like batik, UNESCO crowned the puppets as Masterpiece of Oral and Intangible Heritage of Humanity or the world’s priceless invention of art in Indonesian native art on November 7, 2003. Through the time, wayang has undergone several changes. However this change of wayang art culture did not affect the identity that has been embedded in wayang itself because of its solid main foundation. The main foundation consists of three principals, which is the nature of Hamot that is the openness to receive influence and input from within and outside; Hamong which is the ability to filter the new elements in accordance with existing puppet values; and Hamemangkat, the ability to add a new value to the story so that it is able to follow the changes and the development of the times. First step of Indonesian Traditional Puppets called Wayang, known as Indonesia’s oldest and original culture, has been present since Neolithic era or around 1500 years BC, long before the arrival of the Hindus. It was created by Javanese ancestors. However, unlike today’s puppets, those puppets were way simpler back then. They were merely made of grass tied together resembling human figures and played in Javanese traditional ceremonies. In later periods, people started to use more solid materials such as hide or bark. Wayang is mentioned in an inscription written in the reign of King Airlangga, showing it was performed back then in the 10th century AD. The inscription is known to be the oldest inscription mentioning the puppetry. Initially, wayang was a part of God worship ceremony and was usually done during the harvest and planting season in order to have a good harvest and avoid any kind of misfortune. By 898-910 AD, wayang had been more developed, but still had the same function that is to worship God. Then in the process, the art of wayang culture was increasingly developed in the era when Hinduism entered the country, to being renewed in the era of Islam. When Hinduism entered Indonesia and adapted the existing culture, this performing art became an effective medium for spreading Hinduism. The Ramayana and Mahabharata stories were starting to be used as stories told in wayang performance. The development of wayang is then continued during Majapahit era. The images of wayang on paper at that time were refined by adding small parts rolled into one. Puppet rolls were to be played then the roll should be unfolded. Thus this puppetry was then commonly called as wayang beber (puppets performed after being unfolded). During the last reign of King Brawijaya, the puppetry got a development. The king’s son, named Raden Sungging Prabangkara, known to have great painting skills. The talent of his son was used by the king to upgrade the recent form of wayang Beber puppets with colors. The wayang coloration was used to update the shape of the puppet characters, such as the King, the Knights, the Priestess, Gods, the Punakawan and so on. After the ruin of Majapahit kingdom, then the puppets and some traditional musical instruments, gamelan, were brought to Demak. This was because Sultan Demak Syah Alam Akbar I was very fond of the art of karawitan, Javanese traditional music, and puppet shows. Later, when Islam entered the country, Indonesian Traditional puppets was also used as a mean of spreading the religion. Some important changes were made here. Traditional music gamelan and wayang puppetry were considered forbidden because of the Hindu influence consisted in it. Aside of that, since displaying God in the form of humans was and is prohibited, puppet show was watched only from shadows. A new form of wayang was created. It was made of buffalo leather, the figure was depicted oblique, and its hand size was made in longer proportion, and was longer than the size of a human hand. This puppet is then given a white base color, while the cloth is painted using ink. The performing technique was also changed using screening facilities. Banana trees were used as a place for puppets, there were means of lighting, and a box was used as a place for storing puppets. A new tool was also discovered. This tool, cempala, was hit with the puppet master’s toes to create a sound effect. This puppet show is now known as wayang kulit. Islamic values were also added to the stories, although stories were still mainly about Ramayana and Mahabharata. Wayang beber, the source of wayang kulit, was then removed from the palace performances but was still performed outside the palace. In 1960, when a Catholic missionary Brother Timotheus L. Wignyosubroto was carrying on his mission to spread Catholicism, he developed the Wayang Wahyu, whose source of story came from the Bible. In Central and East Java, the most popular types of wayang are leather puppets or wayang kulit purwa. The narrator is called a dalang or a puppeteer. Besides being the narrator, he is also the one who controls the puppets and the plot that is created. This shadow puppet is flat and made of buffalo or goat skin, with movable arms and legs. In Bali and Java, wayang kulit shows often combine Hindu stories with Buddhism and Islam. In addition to religious stories, folklore and myths are often used. This puppet show often inserts humor or good advice about life as well as religion. 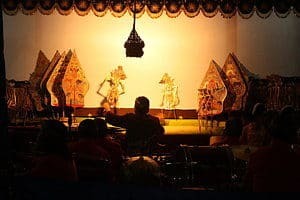 In its performance, shadow puppets are accompanied by Javanese traditional musical instruments, gamelan, with songs that sung by some sinden, woman singers singing with gamelan orchestra. Wayang beber is one of the oldest forms of wayang in Indonesia. In this narrative show, a long drawing sheet is described by a dalang, the puppet master. 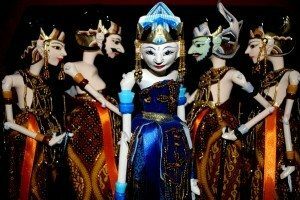 The oldest of these puppets can be found in Pacitan, Donorojo, East Java. Apart from the Mahabharata and Ramayana stories, wayang beber also uses stories from folklore, such as the romance of Panji Asmoro Bangun and Dewi Sekartaji. 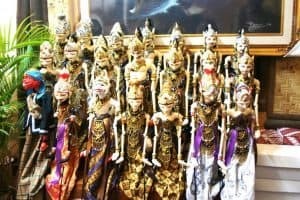 Made from bamboo (bambu), wayang bambu is one of the rarest kinds of art in Indonesia that comes from Kampung Cijahe, Curug Mekar Village, West Bogor District. This art is created and developed by Ki Drajat who is also the mastermind and inventor. Wayang bambu is made of bamboo, more precisely from an inner bamboo rod. The shape and costumes of a bamboo puppet is similar to those used in the other kinds of puppets. The only difference is that it is made faceless. It is made plain, so that the audience is free to imagine about the face of the character. The technique to play the bamboo puppet is similar to wayang golek. Stage is created using banana tree and accompanied by Sundanese traditional music. Wayang Golek Langkung is a typical puppet from Jepara regency. It was established in 2005 by the locals. The puppets are made of bamboo and its head is made of a coconut shell. The name of Wayang Golek Langkung has a deep philosophy. Golek, derived from Javanese language, means look for. While the word langkung which is also a Javanese word, means more. Thus, the name Wayang Golek Langkung can be interpreted to looking for more. People are expected to think beyond worldliness. Being more useful for other people, preparing to face the afterlife (death), and having a meaningful life are what this kind of puppet teaches. The story is also taken from the socio-cultural themes, the arts, and the environments. Kayu is a Javanese word which means wood. From the name, it is pretty obvious that the material used to form this puppet is wood. There are some kids of wood puppet. They are wayang golek, Wayang Menak, Wayang Papak, Wayang Klithik, Wayang Timplong, Wayang Potehi, Wayang Golek Techno, and Wayang Ajen. The show is performed using a three dimensional puppet made of wood. This type of puppet is most popular in West Java. There are 2 kinds of wayang golek, namely wayang golek papak cepak and wayang golek purwa. 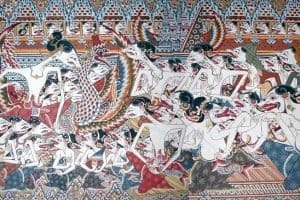 The stories used often refer to Javanese and Islamic traditions, such as the story of Prince Panji, Darmawulan, and Amir Hamzah, his uncle, Prophet Muhammad SAW. Wayang Menak or also called Wayang Golek Menak consists of shaped wooden puppets believed to have first appeared in Kudus area during the reign of Sunan Paku Buwana II. The source of the Wayang Menak story comes from the Book of Menak, written on the will of Kanjeng Ratu Mas Balitar, the consort of Sunan Paku Buwana I in 1717 AD. Wayang Cepak or wayang papak is a kind of puppet art that was developed in Cirebon. The puppet’s shape is almost similar to Golek puppet from Sunda culture but has a flat head crown shape (papak/cepak). That is where the puppet gets its name. Stories used for performances are usually centered on Muslim stories of Arabs by Amir Hamzah, stories from the Hindu kingdom, such as the Panji story which was a prince from around the year 1045 – 1222 and the local stories that usually come from the history. The shape of the puppet is similar to the shadow puppets, but is made of wood, not leather. They also use shadows in the show. The word “klitik” is derived from the sound of wood touching when the puppet is moved, especially during a fight scene. The stories used in this puppet drama come from the kingdoms of East Java, such as the Kingdom of Jenggala, Kediri, and Majapahit. The most popular story for the performance is Damarwulan legend. The story is filled with the story of love affair and is very popular with the public. Wayang Timplong is a kind of puppet art from Nganjuk area, East Java. This traditional art is said to be established since 1910 from Pace District, East Java. This puppet is made of wood. The traditional musical instruments used as musical accompaniment are very simple. Wayang Potehi is one of the typical Chinese wayang puppets originating from southern China. This art was brought by Chinese migrants to various regions of Indonesian archipelago in the past and has become one of the traditional arts of Indonesia. This is the art of contemporary puppet show that puts the technology in the show. The art of wayang golek techno show is an innovative and attractive masterpiece of a traditional cultural arts development which is made as attractive as possible to be accepted by all levels of society. There are not many differences from other wayang golek performances. It is just that this puppet show use multimedia to display a background screen with background animations to fit the scene, and balanced by lighting and laser light on each scene, as well as using sound sytem accompanied by sound effects that support the puppet show scene. Some people may not know this puppet, but surprisingly, Wayang Ajen has been staged in 50 countries. Wayang Ajen uses multimedia and technology approach, making it easier to attract younger generation to like it. The storyline in Wayang Ajen is updated through time to time, following the world’s popular issues. The name was derived from a Sundanese word, ajen, which means value or price. Principally, what this puppet means is mutual respect. Wayang orang or is also called the wayang wong, in Javanese language, is a puppet that is played by using people as characters in the puppet story. Wayang orang was created by Sultan Hamangkurat I in 1731. In accordance with its name, the puppets are no longer performed by playing puppets (leather puppets), but using humans instead of the puppets. They wear costumes just like the ornaments used in shadow puppets. In order that their face or face shape resemble a shadow puppet (when viewed from the side), often that an actor’s face is painted or added with accessories. Wayang rumput, or wayang suket, is an artificial form of various figures of leather puppets made of grass (Javanese: suket). Wayang suket is usually made as a game tool or story telling properties to children in Javanese villages. To make it, a few strands of grass leaves are woven and then strung together (by folding) to form similar figures of wayang kulit. Because the material, wayang suket usually do not last long. Nowadays, artists have put some efforts to make wayang rumput a stage performance. Wayang Motekar is a kind of shadow puppets. However, unlike wayang kulit’s shadow color that is black, the puppet maker has invented a new technique so that the shadow of the puppets can appear in multiple colors. This is due to the basic principle of Wayang Motekar using plastic materials, transparent dyes, and special light and screen systems. Wayang Motekar was discovered and developed by Herry Dim after conducting experiments over eight years, starting from 1993 to 2001. • Wayang Kulit Banjar (Kalimantan Selatan). • Wayang Palembang (Sumatera Selatan). • Wayang Cirebon (Jawa Barat). • Wayang Madura (sudah punah). • Wayang Siam (Kelantan, Malaysia). Not only loved by Indonesians, wayang also draws interest from people around the world, especially wayang kulit, or leather puppet. Considered as a unique show, not a few foreigners study one of these cultures. They even learn to become the puppeteer or the dalang. Wayang kulit is defined as a world cultural heritage derived from Indonesia on 7 November 2003 by UNESCO, a United Nations (UN) organization that deals with education, science and culture issues in the UN member countries. These puppet arts are then designated as Oral World Master Pieces of Intangible Heritage of Humanity since. However, not only puppet leather show, some other kinds of Indonesian traditional puppets are also highly recognized by the world, such as wayang ajen. Wayang ajen has been performed in 50 countries in around the world. Those countries include France, Italy, Netherlands, Greece, Argentina, India, Russia, Brazil, Hungary, and Bulgaria. The puppet was also performed in The International Festival Alexandria for Puppets 2014 in Alexandria, Egypt. Many agree that these traditional arts of Indonesia are highly valuable and unique. Indonesians should be proud of it and put more effort to be more familiar with these traditional puppets. Many can be learned from these arts due to its values and philosophy.